The acclaimed author’s vast body of work is on exhibit By A. N. Devers A. N. Devers is an arts journalist and editor. Her first book, Train, comes out from Bloomsbury in 2019. She is the proprietor of The Second Shelf, a rare book business focused on books by and about women. It’s not a surprise that John Ronald Reuel Tolkien received a lot of fan mail during his life, but it is a surprise how diverse in nature it is. There are fan letters written using runes or attempts at Elvish, there are drawings, there are photographs sent by admirers dressed as characters from the books, and there is even mail from royalty. “The range of fan mail illustrates the surprising reach of his fiction and the extraordinary number of lives it touched,” said Catherine McIlwaine, an archivist at the University of Oxford’s Bodleian Library. For fifteen years, McIlwaine has had the dream job for a Tolkien fan: Tolkien Archivist, charged with sorting through an archive of papers, manuscripts, artwork, letters, objects, and assorted ephemera related to the Oxford don and creator of arguably the most beloved fantasy series of all time. For the last five of those years, she has been preparing for the Bodleian’s monumental survey of his work, Tolkien: Maker of Middle-earth, the first exhibition dedicated specifically to Tolkien in twenty-six years at the library, and the first time since Tolkien sold The Lord of the Rings manuscripts to Marquette University in Milwaukee, Wisconsin, that they have returned to England. For such a significant exhibition, it is not particularly large. It doesn’t, for instance, foray into the film adaptations; instead, McIlwaine has homed in on highlights from the library’s archive in order to convey and document Tolkien’s life experiences that might have led up to his creation of the world that is Middle-Earth, which includes The Hobbit, The Lord of the Rings trilogy, The Silmarillion, and other books, notes, and unfinished manuscripts that support his universe. Tolkien, there is no doubt, excelled at building entire worlds—mapping them out, populating them, and inventing new languages for its residents. The exhibition is incredibly and unexpectedly moving. After Tolkien’s father died, his mother had no financial support and they had to rely on family, and then his mother died, too. He was a scholarship student at college, and he was a soldier. He certainly encountered hardship and trauma in life, but he didn’t seem to let it affect him. Instead, or perhaps because of all these obstacles, he relied on his education and allowed his love of language to become a secret, at first, obsession. If any of the setbacks of his young life scathed him, there’s little evidence—or there is plenty of evidence in the lack of evidence. He buried himself in research and writing, and it gave him the tools to escape, and then he made it accessible enough for a world of readers to join him. 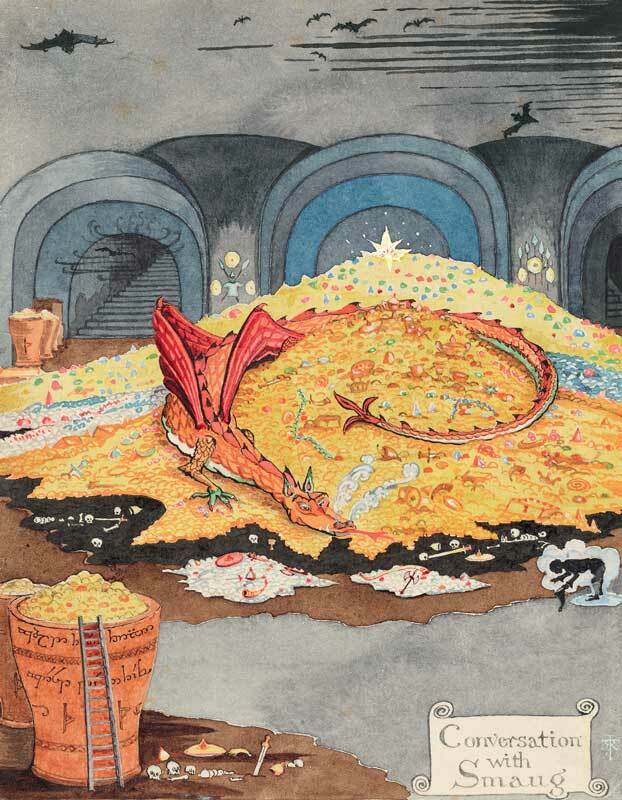 Tolkien’s artwork is colorful and joyful, too. 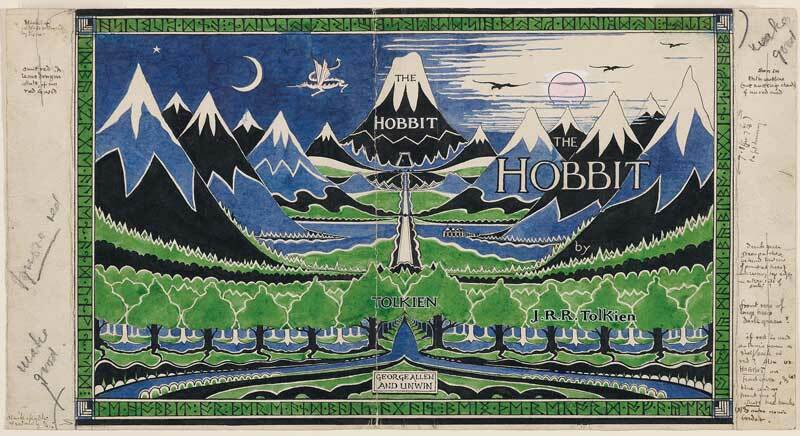 Those familiar with his two-toned dust jackets for The Lord of the Rings might be surprised to learn how vibrant and rainbow-hued his initial sketches were. To keep costs down, the publisher banished red from the cover of The Hobbit. 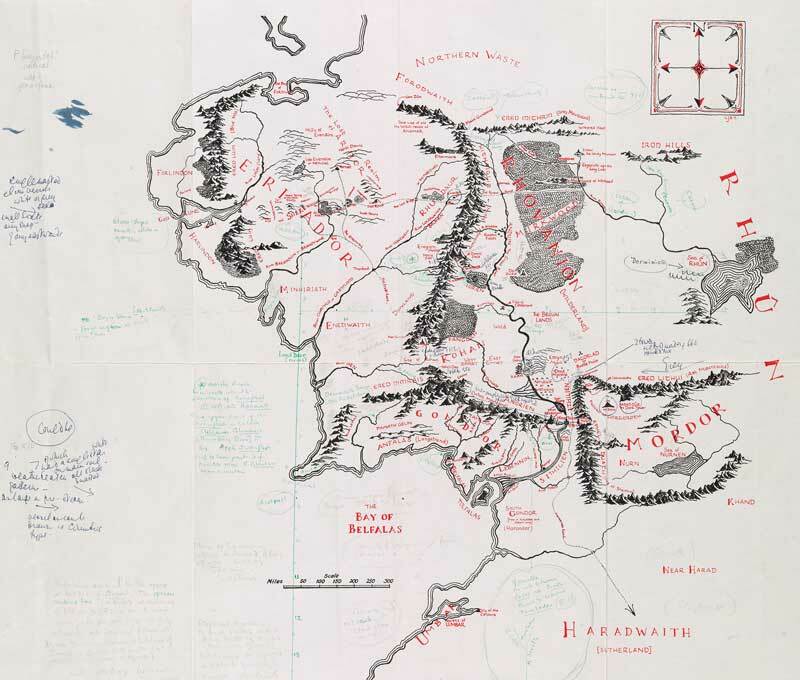 The draft cover designs for The Lord of the Rings are quite sparse and dark, somewhat brooding, but Tolkien in his spare time doodled whimsical drawings next to his completed crossword in the newspaper, filling the column widths with paisley shapes and lively, sweet, geometric drawings. These are some of the revealing touches that suggest the nature and personality of Tolkien, but no more so than the artwork and notebooks in which he designed the land of Middle-Earth itself: his concentration on calligraphy, his focus on mapmaking before storytelling, his purposeful use of script to make his own signature and writing look of-a-distant-land. All of these particular flourishes helped build Middle-Earth, a world that is both similar to and different from ours (Hobbiton, Tolkien pointed out on one of his maps, is the approximate latitude of Oxford), and that has allowed readers for decades to experience Middle-Earth as deeply human and yet extraordinarily fantastical and inventive. That is the best fantasy can offer in a nutshell, to allow surprise at the wonder of who and what we are, and what we can create, if we give ourselves the chance. Tolkien: Maker of Middle-earth remains on view through October 28, after which it will travel to the Morgan Library & Museum in New York for a January 2019 opening. In late 2019 the Bodleian and the Bibliothéque nationale de France will collaborate on the largest Tolkien exhibition ever to be held in France, where McIlwaine noted, they don’t have as much of a history or interest in fantasy literature as a genre. The Tolkien exhibition there will celebrate France’s own fantasy writers and place their work in a larger context. A. N. Devers is an arts journalist and editor. Her first book, Train, comes out from Bloomsbury in 2019. She is the proprietor of The Second Shelf, a rare book business focused on books by and about women.